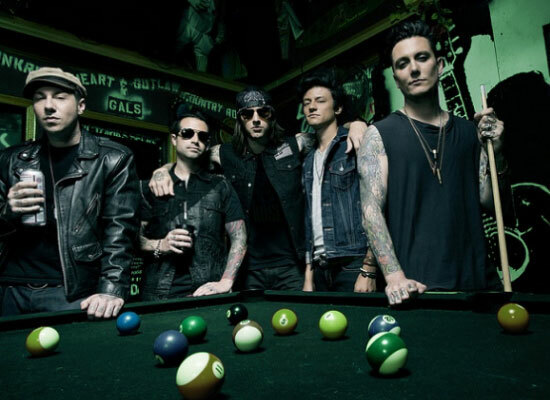 Avenged Sevenfold Biography, Discography, Music News on 100 XR - The Net's #1 Rock Station!!! 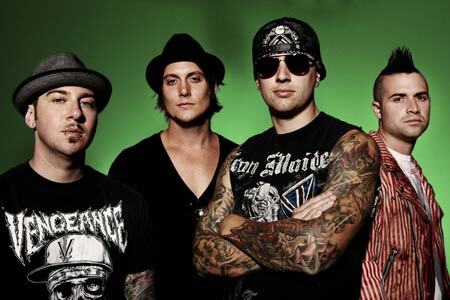 Comprising vocalist M. Shadows, lead guitarist Synyster Gates, rhythm guitarist Zacky Vengeance, bassist Johnny Christ and drummer Jimmy 'The Reverend' Sullivan best known as 'The Rev', Avenged Sevenfold formed in the summer of 1999 in Huntington Beach, California USA, while all members were still in high school. The quintet took the band's name from the Biblical story of Cain and Abel and created their unique sound, blending Metal, Emo and Punk-Rock. They recorded their debut album, 2001's "Sounding The Seventh Trumpet", when they were 18 years old. Since then, they've made the road their home, hooking up with heavy-Rock acts such as Shadows Fall and Mushroomhead. 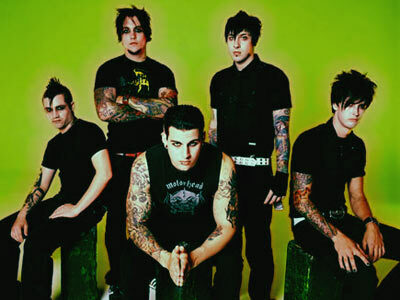 August 2003 saw the release of the band's sophomore effort, "Waking The Fallen", which cracked the American Top Independent Albums chart, peaking at #12. Avenged Sevenfold unleashed its third full-length CD and Warner Bros. Records debut, "City Of Evil", in June 2005; it reached the #30 position on The Billboard 200 Albums chart spawning the smash hit "Bat Country", which peaked at #2 on the Active Rock chart and at #6 on The Modern Rock Tracks. The album eventually managed to attain platinum certification and yielded two more Hot Mainstream Rock top 20 hits: "Beast And The Harlot" and "Seize The Day". For the selft-titled follow-up, the band gets even harder and heavier; "Avenged Sevenfold", the group's first album to be self-produced, was released in October 2007 and quickly catapulted into the top 5 of The Billboard 200; it generated three Rock radio top 20 smashes, chief among them "Almost Easy" which rocketed to #3 on The Hot Mainstream Rock Tracks and also hit #6 on The Hot Modern Rock chart, "Afterlife" faltered just outside the top 10 of the Active Rock list while "Scream" inched its way to #9 on the same chart. Another single, "Dear God", offered some variation from their alt-Metal intensity sound. On December 28, 2009, James Sullivan was found dead in his Huntington Beach home; according to a police official he died of “natural causes”. 'The Rev' was only 28. The four remaining members enlisted the help of Sullivan's drumming hero, Dream Theater's Mike Portnoy and resurfaced in July 2010 with the band's fifth album, "Nightmare". The disc shot to #1 in the States, hit #2 in Canada and ascended into the top 10 on both U.K. and Australian sales charts. The title-track was quickly picked up by Rock radio stations across the U.S. peaking at #3 on Billboard's Rock Songs and #12 on The Alternative Songs charts; similar chart success was achieved with the second single, "Welcome To The Family", #8 on The Rock Songs chart and #15 at Alternative stations. The next single was the stirring ballad "So Far Away", a song the band dedicated to The Rev, which crested at the #1 spot on the Active Rock chart and at #15 on the Modern Rock airplay list; the final single, "Buried Alive", was another Mainstream Rock top 3 hit for the band. In early 2011 drummer Arin Ilejay, who later became a permanent member, joined the group for their Nightmare After Christmas Tour. 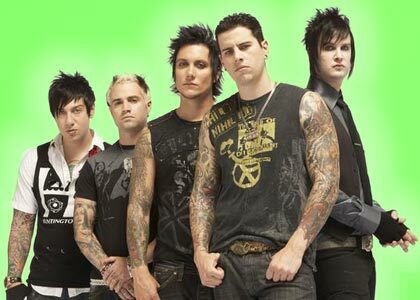 In late September 2012 Avenged Sevenfold returned with a new single titled "Carry On", featured in the soundtrack to the action adventure game "Call Of Duty: Black Ops II", the track slammed into the top 3 of The Active Rock chart. The band's sixth studio album, "Hail To The King", followed in August 2013 opening atop The Billboard 200 list and the first single, the disc's title-track, also peaked at #1 on The Mainstream Rock chart.